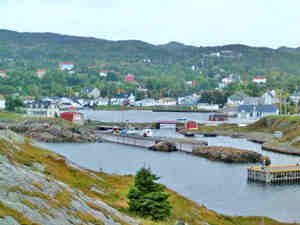 Brigus stands at the forefront of Newfoundland's heritage settlements. The origin of the name Brigus is not known for sure. One theory has it coming from the town names ofBrickhouse or Brighouse, in Yorkshire, England. Another has the name coming from the French word for intrigue or plot, Brigue. The town counts among its settlers, pioneers from England, Ireland and Wales. It was at one time one of the major sealing ports. In 1847, Brigus sent sixty-six vessels to the seal hunt and over half were captained by natives of Brigus. Although no one knows for sure when Brigus was settled, one tradition is that it was settled shortly after Cupids. It is said that the settlement started in 1612, when the Spracklin family purchased half the harbour from John Guy. However, there is a written record of the population in 1675, when the first census of Newfoundland was compiled. Sir John Berry's census of 1675 lists 34 people living in Brigus, with three fishing rooms in operation. Two years later, the Poole census showed three families operating five fishing rooms, as well as raising cattle and pigs. In 1697, Brigus was captured and burned by the French under Pierre Le Moyne d'Iberville. The French did not want residents of Brigus to escape to Carbonear Island, which had been fortified. Houses at Gallis Cove and Riverhead were burned. Legend has it the French were on their way out of the harbour when they heard either a crowing rooster or a barking dog in Frogmarsh where other houses were hidden by the trees. They returned and burned the seven houses. At this time Abbé Baudoin, the priest who accompanied d'Iberville, reported that Brigus “was a well established English settlement, where there were about sixty men.” He said the French found 6000 salt cod fish stored at Brigus. In March 1705, a French force commanded by Jacques Testard de Monigny burnt Brigus a second time. However there were no lasting effects on the community. The war ended in 1713 without any further attacks. The birthplace of Captain Robert A. Bartlett, the master mariner of arctic fame has immortalized the town in the annals of history. The monument at Bishop's Beach is a major tourist attraction, while Hawthorne Cottage (Bartlett's home in Brigus) has been declared a National Historic site. The town also boasts a reconstructed Stone Barn Museum, using all the stone from the original stonehouse. It stands as a tribute to the town's history. The Tunnel through solid rock on the waterfront, built in 1860 under the supervision of John Hoskins, a Cornish miner, provided a deep water berth for the Bartlett sailing ships. As you walk through our shaded, winding, ancient streets, take a step back in time and be reminded of an era long past, but not lost in our beautiful town. Stops along the way will let you visit our historic churches, view homes built almost 200 years ago. See the site ofThe Vindicator, where the Brigus newspaper was printed at the turn of the century, the Convent of Mercy ( built in 1860) the Orange Lodge, and the Jubilee Club(which is now the library) which was the meeting place of the "Merchant Princes of Brigus" from the late 1800's to the mid 1900's. Landfall, which is a Registered Heritage Structure, is located in the hills to the north west of Brigus. The site of a Military Battery protecting the entrance to the Harbour, the home was built in the early 1800's by the Pomeroy family. For most of the 20th Century, it has been a studio for artists. The most famous of these, the American artist and illustrator, Rockwell Kent, took up residence during the First World War. His solitary lifestyle caused locals to become suspicious, and the Newfoundland government deported him as a spy. We invite you to visit our town, relax, stroll our streets, admire our large trees, visit Craft Shops, have an Afternoon Tea or stay for dinner at one of our restaurants , enjoy a weekend at our RV Park, one of our Bed and Breakfasts, or one of our Guest Homes, which are among the finest on the Island.